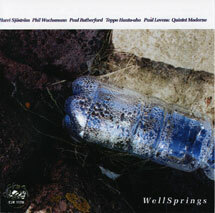 Harri Sjöström, soprano saxophone; Philipp Wachsmann, violin, viola, electronics; Paul Rutherford, trombone; Teppo Hauta-aho, double bass; Paul Lovens, drums, selected cymbals, singing saw. Recorded live on 25 November 2001 in Prague Castle, Prague, Czech Republic. Cover photograph (reproduced above) by Harri Sjöström; layout by Tom Tomczyk.